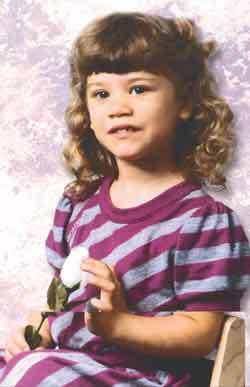 Nyssa Campbell at age 3: Because her birth mother drank, the child faces horrific lifetime odds. When Ivy and Rodney Kiddle of Raymond, Alta., 15 miles southeast of Lethbridge, adopted their son Randy (not his real name) 20 years ago, he was a round, happy, 14-month-old whirlwind of energy. We knew his native mother and father were chronic alcoholics, but back then there was no knowledge of fetal alcohol syndrome, Mr. Kiddle says. As with most such children, the problems struck with pubertyovernight. Randy went from being the protector of the little guy to a bully. He started getting into drugs, alcohol and, with his quick temper and disreputable acquaintances, plenty of trouble. At 19 he was diagnosed with fetal alcohol syndrome (FAS). Now 21, Randy is facing his seventh assault charge. The Kiddles are not alone. Each year an estimated 4,000 Canadians are born the victims of FAS or fetal alcohol effects (FAE). Both involve brain damage caused by their mothers heavy drinking during pregnancy. On September 9, the ninth day of the ninth month at 9:09 a.m., bells around the world tolled, raising the alarm for the 60 million people worldwide who are marginalized by the disorder. In Canada it is six times as common as AIDS, responsible for 50% of those in prison, costs taxpayers more than $2 million per person for special care and supervision during their lifetime, and is the leading known cause of mental retardation in the western worldyet is entirely preventable. Strangely, however, the disorder is largely unknown to the average citizen. Although the bells tolled for this invisible plague, organizers warn that with these increasingly grim statistics, the bells should be a wake-up call for everyone who loves children. The root cause of the phenomenon, she says, is that women are drinking more than they used to. We want the world to remember that during those nine months of pregnancy, and while breastfeeding or planning to conceive, a woman should not consume alcohol. Like countless adoptive parents, Ms. Buxton and her husband, Brian Philcox, spent eight intolerably frustrating years and tens of thousands of dollars trying to obtain a diagnosis on the many mysterious disfunctions faced by their daughter, Colette, now 20. As Ms. Buxton documented in the March issue of Readers Digest, they finally found a professional knowledgeable in FAS, only to receive the diagnosis too late to make much difference in her life. Many such parents are demanding change. Their work, combined with new research, offers fresh hope for the future. The national spotlight was focused on FAS earlier this year when a young man diagnosed with the condition was charged with abduction and first-degree murder. David Trott, 20, is accused of killing nine-year-old Jessica Russell, whose body was found in a burned-out trailer near Mission, B.C., on May 5. Before the killing, Trott had requested psychiatric help, but was told none was available. During his hearing, he gazed vacantly around the courtroom, and near the end of the process, asked his lawyer what he was charged with. He is now undergoing psychiatric assessment to determine his mental competency to stand trial, and his preliminary hearing is set for January 15. It is no coincidence that John and Randy are adopted Indian children; FAS/FAE has reached epidemic proportions among the aboriginal population. A 1987 article in the Canadian Medical Association Journal reported an FAS prevalence of one in every eight children in a small B.C. Indian community, while in some remote Alaskan villages, FAS has been reported in one out of five births. In 1997, teachers in an Ojibwa school in northern Manitoba sought help when half their students were incapable of learning. Researchers found an astounding 30% of mothers admitted to drinking heavily during pregnancy. 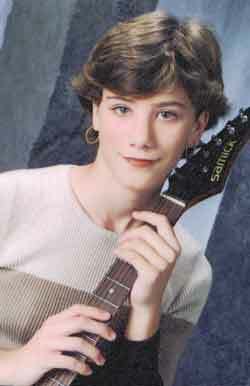 Ten percent of the children were diagnosed with FAS, and three to four times that many with FAE. In other words, nearly one-half the children on the reserve are brain-damaged due to prenatal exposure to alcohol. Nor is this reserve unique, according to medical geneticist and professor of pediatrics and child health at the University of Manitoba, Dr. Ab Chudley, who conducted the research. While stressing that the FAS problem is not one of race but of social circumstancepeople turning to alcohol to drown their problemshe believes that FAS, rather than the traditionally blamed culture clash, is the reason many Indian-white adoptions break down. When these teenagers suddenly go absolutely berserk and become uncontrollable, its not cultural clash, its the outcome of alcohol exposure prenatally, Dr. Chudley asserts. resulting in lifelong permanent disorders of memory function, impulse control and judgment. Often unable to learn from previous consequences, in the words of one parent, two days after burning the house down, they are again playing with matches. Experts explain it by comparing the brain to a filing cabinet full of memories. When people with a normally functioning brain decide, for example, to go shopping, they figuratively go to the file in their brain marked shop and repeat the actions found there. A child with FAS/FAE has the files, but they have been spilled all over the floor. It takes more time and more prompting to find the correct file. 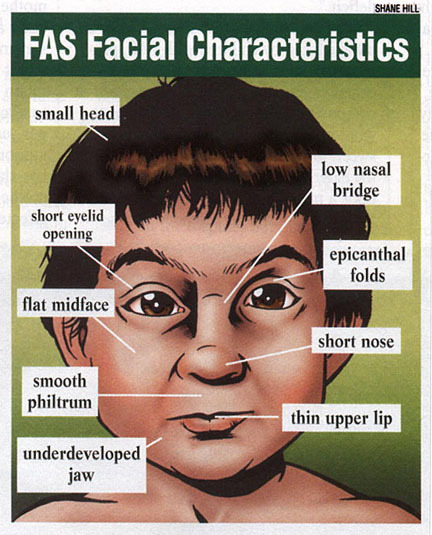 Children with FAS have distinct facial features and a smaller stature as well as learning and behavioural problems; children with FAE appear normal but have similar neurologically based learning and behavioural problems. Because children with FAE do not have the distinctive appearance and typically have high verbal skills (although comprehension may be lacking), they look and talk well, so diagnosis is often missed. Even with the telltale features of FAS, however, a 1990 study by Little, Snell and Rosenfeld found a 100% failure rate to diagnose FAS at birth at a large American teaching hospital. Parents are lobbying for better education for those in the caring professions, since children whose problems are diagnosed by the age of eight do best; the rest are often accused of wilfully misbehaving and repeating mistakes when the real problem is that their brains do not work like others, so they need extra prompts and time to achieve the same results. A lifetime of such misunderstanding often leads to secondary disabilities: depression, anger, mental illness and substance abuse. This in turn leads to unwanted pregnancies and trouble with the law. Just as different women have varying abilities to metabolize alcohol, so do their unborn children. Studies of fraternal twins have found that one baby may be born healthy while the other suffers from FAS. Developmental effects of alcohol also depend on the amount, timing and conditions of exposure. Much facial damage occurs by day 20 of the pregnancy, before most women realize they are pregnant; damage includes a reduction in skull circumference, a small upper lip and nose, smaller jaw and contracted eyelids. Because of the wide variation in reactions to alcohol, researchers recommend the only way to completely eliminate the risk of FAS is not to drink at all during pregnancy. Others, like Bonnie Buxton, point to University of Washington studies indicating that a mother taking one drink per day can lower her childs IQ by seven percentage points. Pharmacologist Elaine Ho, who answers the Motherisk healthline, advises pregnant callers to discontinue drinking. Its probably safest because a safe level of alcohol use during pregnancy has never been established, she explains. When it comes to FAS, experts say, we must look at prevention, because as a society we cannot afford the consequences. Businesses are already taking up the cause. On September 1, for example, B.C. liquor stores unveiled new posters indicating that the responsibility to reduce drinking during pregnancy rests not only with the expectant mother, but also with those around her. The posters depict five hands covering a glass of alcohol, four representing the responsibility of all adults, while the top hand, a babys, represents the unborn child. In Alberta a number of restaurants are participating in a Born Free program, offering free non-alcoholic beverages to pregnant customers. As for the success of the Washington mentoring program, three years after leaving it, 40% of clients were abstinent and had been clean and sober for at least six months, compared to 28% of control mothers. Clients were more likely to enter alcohol or drug treatment service, stay in recovery, deliver fewer subsequent substance-exposed children and retain custody of the target child. The total cost was approximately US$3,800 per year per clientas the studys authors point out, less than the cost of two days in intensive care should the mother deliver another alcohol- or drug-affected baby. In all societies, men drink more than women; in recent decades, however, that gap has narrowed. The Institute for Alcohol Studies in Britain recently reported that 13% of female drinkers are drinking over the recommended limit of 14 units of alcohol per week, while 2% are drinking at very high levels of over 35 units per week. That 15% total compares to 8% of women who were drinking over the recommended limits in the late 1980s. At highest risk are lone parents with children, those who live in urban rather than rural areas and those who have less contact with relatives or neighbours. In North America, the greatest increase in alcohol use in the 1990s was among college-educated Caucasian women, unmarried or students, with a household income greater than $50,000 a year. The number of women who drank during pregnancy jumped from 10% in 1992 to 15.3% in 1995, according to Obstetrics and Gynecology (August 1998), despite warning labels on alcoholic beverages and public education programs. Experts blame increased drinking for women on the fact that it is now a more socially acceptable and expected activity. The advertising industry has, in recent years, targeted the growth market of women drinkers, and has been criticized for portraying alcohol as fashionable and glamorous, used by women who are independent, fun-loving and desirable. 70% will have problems with employment. Nyssa today: A sign of hope. The National Institute on Alcohol Abuse and Alcoholism in Bethesda, Maryland, is working on promising research for preventing and diagnosing FAS. Program administrator Laurie Foutin cautions that most experimentation is still in the preliminary stages on animal models, but says it bodes well for future application to humans. As the brain develops, peptides (amino acid compounds) help cells to make proper connections so that parts of the brain can interact. Ethanol inhibits growth, while peptides stimulate further growth. Injecting two synthetic peptides into the bloodstream of a pregnant mouse restores normal growth, not only to the fetus brain, but also to its body. Since many women are reluctant to reveal heavy drinking during pregnancy, in order to determine if a baby has been exposed to alcohol, specialists can now analyze the meconium (first stool) for fatty acid ethyl esters. A positive test does not mean the child has FAS, but does act as a biomarker for exposure, indicating the child should be followed during early development and not overlooked. A special hearing test measures brain-stem response. If there are abnormalities, the baby can be referred for intensive follow-up. Eyeblink conditioningpairing a tone with a puff of air on the eyecan train a small child or animal to blink before the puff. Rats prenatally exposed to alcohol are impaired in that response. Studies are examining magnetic resonance imaging to determine which regions of the brain are not affected so those can be reinforced and capitalized upon. Past research has determined that steady practice in acrobatic skills involving balance and coordination like walking rope bridges and narrow beams stimulates growth of new synapses in the cerebellum, dramatically improving the ability to perform new motor tasks. Now Professor Charles Goodlett of Indiana University has found that in rats, synapses can be created in other parts of the brain, including the cerebral cortex. This governs memory, attention, and even control of behaviourall deficits for those with FAS/FAE. He has reported at scientific meetings that there is clear evidence that the effects of prenatal exposure to alcohol are not immutable. People are not completely condemned to a lifetime of certain behaviours, although they may be limited, he states. He recommends challenging the intellect as much as possible by providing complex new tasks like learning to play a musical instrument, increasing the complexity daily, while understanding that positive change may take months. Doctoral candidate Michael Thomas at the University of New Mexico recommends hide-and-seek and puzzles for young children, and for older children, games which require thinking of two concepts simultaneously, such as number games in which the child remembers three numbers, then says them backward or repeats the second or third one back. This requires that they store what was required, as well as the string of numbers, Mr. Thomas explains. For those in Grades 1 or 2, anything involving several different items like colours, numbers, shapes; for example, putting the right-coloured object in the right-shaped hole. It is also very important, he stresses, for parents to educate teachers in techniques they have found effective with their children.